The coin was available for purchase from the U.S. Mint from January 1, 1999, through December 31, 1999. 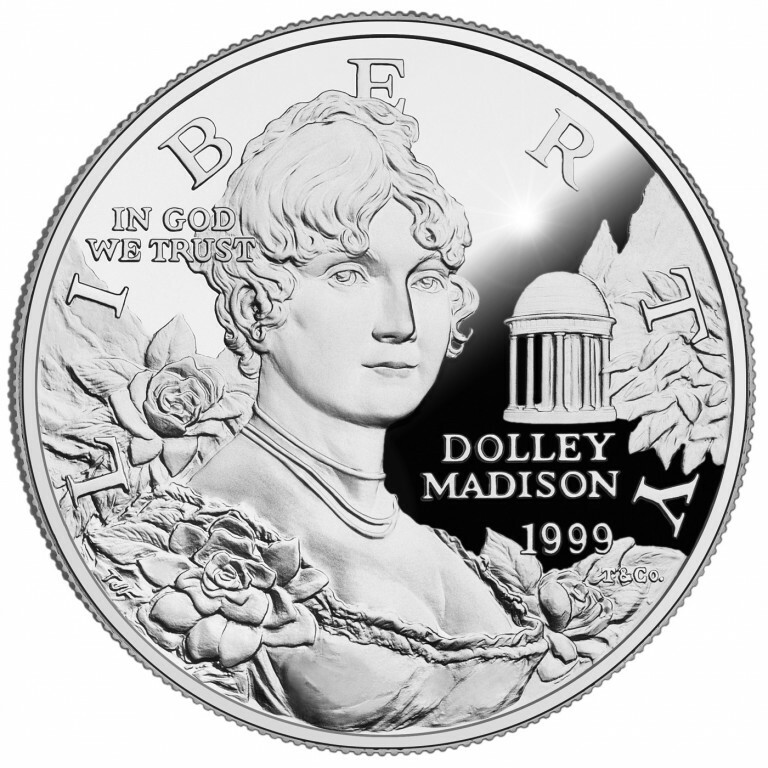 The coin was authorized to commemorate the 150th anniversary of the death of First Lady Dolley Madison. Dolley Madison defined the role of our nation’s First Ladies, setting the tone for presidential spouses since. Her husband, James Madison, was the father of the Constitution and the primary author of the Bill of Rights. Mrs. Madison’s contributions to the country were significant as well. Known for her grace and wit, Dolley Madison served 16 years as hostess of the White House, first during the presidency of the widowed Thomas Jefferson, and later during the administration of her own husband. During that time, she presided over the first inaugural ball in 1809 and is believed to have started the tradition of the White House annual Easter egg hunt. When the British advanced upon Washington in 1814, Dolley Madison showed the courage for which she would also be remembered. As the British set fire to large parts of the nation’s capital, Dolley Madison rescued Gilbert Stuart’s famous portrait of George Washington and a number of important government papers. The Dolley Madison Commemorative Silver Dollar is the first coin to honor a First Lady, and is the first coin designed by Tiffany & Co.® (whose hallmark, T&Co, appears as an artist mark on both sides of the coin). The design is based on a portrait of Dolley Madison by Gilbert Stuart — the same artist whose portrait of George Washington she rescued from the British. The obverse portrays Dolley Madison bordered by a bouquet of Cape Jasmines, her favorite flower, in front of Montpelier’s classically-inspired ice house. The reverse shows Montpelier surrounded by willow trees and foliage. A portion of the proceeds from this benefited The National Trust for Historic Preservation for the purpose of maintaining Montpelier and its 2,700 acres. Dolley Madison surrounded by a bouquet of Cape Jasmines, her favorite flower, in front of Montpelier' classically-inspired ice house. 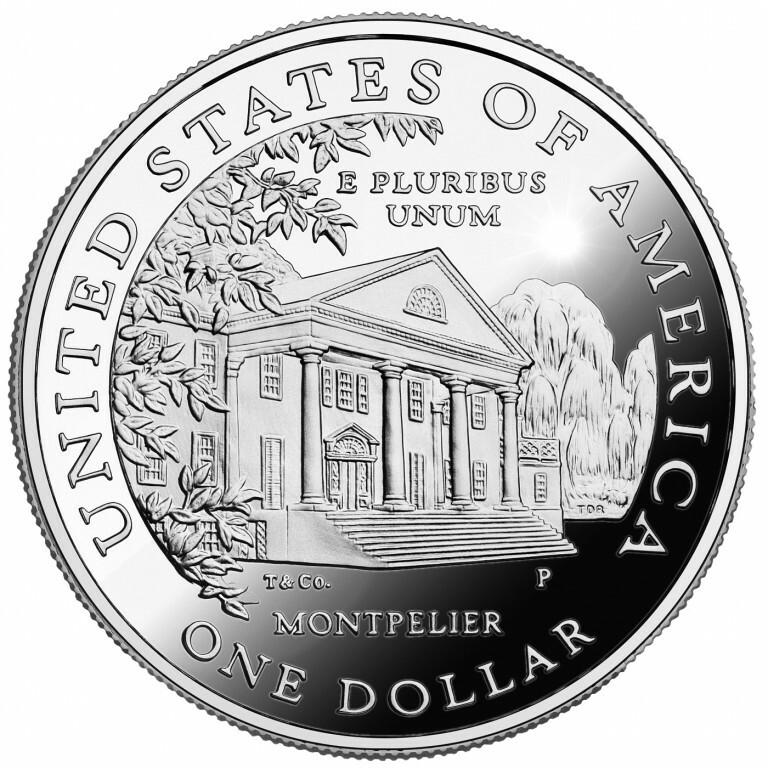 The reverse shows the landmark Montpelier, with its columns and lush willow trees and foliage.